This entry was posted on Friday, September 9th, 2011 at 14:16 and is filed under Media, Politics, Sarah Palin. Twenty-three years of marriage can teach a man a great deal if he pays close attention. What the length of my marriage has taught me is that I can never pay close enough attention to “get it.” Still, I try, and while she contends I’ve shown little improvement in understanding, I nevertheless find myself more adept at recognizing them. It was my assumption that while she might watch the film, she wouldn’t be moved by it, if only because she’s really not a politically-engaged person, or so I have always thought. This past Tuesday, since it’s now available on Pay-Per-View on Dish Network, I sat down with Evelyn to watch The Undefeated, and learned again how more than two decades of marriage still hasn’t taught me enough. Evelyn likes to be comfortable to view a film, and so as I dimmed the lights, she settled in for the two hour film. As I’ve mentioned elsewhere, after the length of our marriage and all we’ve been through, her tendency to skepticism is a big lens through which she views the world. She was thoroughly prepared to be underwhelmed, leading me to my expectation of a “ho hum” appraisal. I pressed “Play” and leaned back, not to watch the movie so much as to watch Evelyn’s reaction. The light in the room, reduced to that provided only by the screen itself, provided me the cover from which to make my observations. The film opens with a barrage of filth flung at Sarah Palin by left-wing media types. I watched Evelyn’s reaction to this, and it was initially a jaw-dropping, eye-widening moment. As this part of the film continued, she began involuntarily to withdraw into a sort of defensive posture. Evelyn is many things, but what she has mostly been is tough-minded, and tough in spirit. 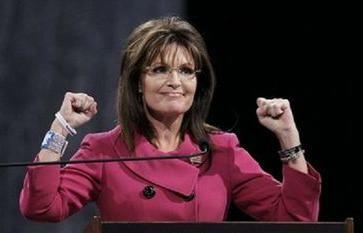 A child of post-war Germany, to watch her recoil at the sheer infamy of the attacks on Palin was a telling moment. She’d seen some of it before, as we all have, but the sheer weight of the disgusting diatribes proved more than she wanted to bear. Almost as a form of relief, the segment subsided, but Evelyn’s anger had not. Gently, as a counterpoint to the vile hatred heaped upon Sarah Palin, you then see a wonderful collage of home movies and imagery from her youth. There came a point at which young and bespectacled Sarah is shown dancing about in childish revelry and my wife began to smile. You might wonder why, but I know too well. Evelyn’s date of birth is separated by Sarah’s by one digit on the calendar. Despite being born on a different continent, they were born in the same era, and of the same sort of values, and Evelyn also had a father who made home movies of their trips, their vacations, and any other excuse to record the growth of the children and the memories of the family. She was born with some vision problems, and also became accustomed to wearing glasses at a young age. Somewhere, there is a similar home movie of Evelyn enjoying similar playful moments in the whimsical innocence of youth. These short flashes of childhood imagery establish a connection to average Americans, or frankly, average people everywhere, and lay a foundation of common values and the extraordinary aspirations to which they give birth in the moments of our youth. What I perceived in her reactions to the images of young Sarah Palin was a recognition of this common ground, and perhaps even a common understanding of the world, as seen through lenses separated by thousands of miles and oceans, yet born of the same enduring spirit. From there, the viewer is taken on a walk through the political rise of Sarah Palin. It wasn’t an easy road, and she faced formidable challenges along her course, but she confronted them with integrity and courage. In short, she set out to do what is right, rather than that which is easy. While uncommon among politicians, it’s not something nearly so rare among average Americans. Most of the time, in most issues that matter, average people choose to do what is right because it is right, and only because it is so. Watching Evelyn’s body language and expressions, what I observed were the nods of approval that accompanied the more dramatic instances of Palin’s willingness to ignore the conventional wisdom and simply do that which ought to be done. At one point, she looked over at me and asked if I thought it is still possible for politicians to do what’s right. I shrugged and left the question lying for the answer given by the remainder of the film. Rather than tell you about how the film ends, I’d prefer to tell you about Evelyn’s appraisal, because I suspect it will be shared by many people who watch this film. She has always liked Sarah Palin, but in truth, she’s simply not the sort to get excited about politicians, celebrities, or much else in the media. Her own prevailing sense of disgust with politics informs her general view that most politicians are not far-removed from her appraisal of Palin’s attackers. She views politics as the sort of ugly gladiatorial spectacle that tends to obscure the difference between that which is plainly right, and that which is inexcusably wrong. She likes Mark Levin because she hears in his voice and in his positions the clear marker of disdain for illogical notions, and as she’s become more familiar with Tammy Bruce of late, she particularly enjoys Tammy’s passion, but also her willingness to openly mock the hypocrisy of those who seem more interested in the combative facets of the political gamesmanship than the practical aspects of what all this fighting is intended to resolve. Indeed. Evelyn may not be a political person in the sense of following the perpetual machinations as you and I do, but she knows what she believes. On the rare instances in which a politician actually receives her approval, I pay close attention. When she actually defends one, I’m not quite sure what to make of it. She’s really never done that before. Maybe the lesson is that the movie The Undefeated delivers a powerful message, or perhaps it’s simpler still: Palin herself is a powerful messenger in answer to Evelyn’s earlier question: Yes, politicians still can do things simply because they’re right. Sarah Palin is the living proof. Mark, you just never cease to make my day. Kudos. You are a blessed man, Mr. America. I have the sense that whereas there may not be many men left with the intestinal fortitude to stand up for what is right, more of our dear women are going to this time around. More Tammys and Sarahs and Evelyns. Gloria Steinem should be getting out front on this new movement. Isn't Sarah exactly the woman she envisioned? Mark, you could have saved yourself much time trying to figure out the "woman thing". It boils down to this: We husbands need only concede that our wives are always right and our lot in life is to follow their orders. It's really not that complicated. I am a certified Palinista…my hubby, however is not…he thinks Sarah is a good looking lady with a few good ideas that got chewed up by the media and therefore can never be elected. I mentioned to him that I wanted to watch PPV Undefeated but he gave me that look of boredom…So, I plan to buy the DVD when it comes out and the next time he is feeling remorseful for doing or saying something stupid, I'll just be nice and ask him again to watch the movie with me….yup, that's the plan. Hey Mark–Hubby said something real dumb this morning and was very nice to me afterwards–because he knew he was wrong…I kept thinking, darn-No Sarah movie yet!!! HA!!!! PS-Hubby is way too cute to stay mad at–and he knows this too. Mark, this piece is among the finest writing I've read in some time. I don't know if you intended it to be but it read like a love letter to your wife, with Sarah Palin simply part of the scenery. In addition to being inspired yet again, I'm touched. Thanks for sharing this perspective.